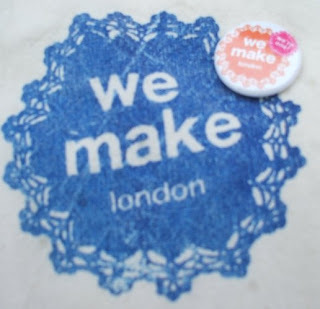 Just over a year ago I went to London to visit the first ever We Make London craft fair. Most of the stallholders were UK Etsy sellers, and it was a fabulous event. I was lucky enough to nab one of the goody bags - and indeed I still use it daily to carry my lunch and other bits and bobs in to work. 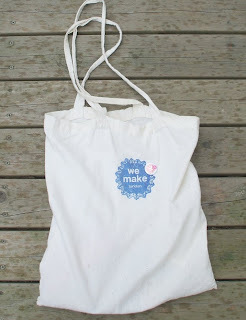 I was lucky enough to get picked to win one of the 50 We Make London birthday badges, seen here on my bag. I spotted today on the We Make blog that they've announced their new Autumn fair - I recommend the team highly! It'll be a great day whether you go along as a seller or as a buyer - but take my advice and get there early! Look mum - the Meerkat's got new clothes! My tiny tweet has arrived!